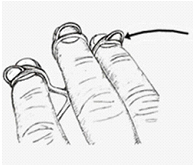 Place two adjacent fingers in one loop. Slowly spread the ringers apart and then relax them slowly. Place the finger to be exercised in loop. 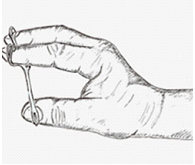 Place a finger from the other hand into the loop as anchor. 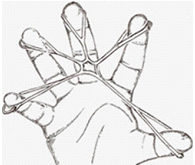 Spread the finger to be exercises. Now pull the finger against the resistance. Repeat. Place one finger in one loop, palm facing up. 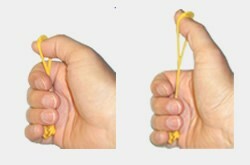 Hold the remaining loops with the other hand. Slowly raise the finger against the resistance. Keep the other three fingers rested on the other hand. Relax finger slowly. Repeat. 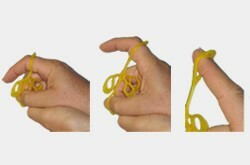 Place the thumb in one loop and the little finger in an opposite loop. 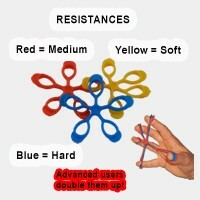 Spread thumb and little finger apart against the resistance. Repeat. Whenever needed use your other hand/finger and/or solid surface to stabilize. All exercises can be performed with all levels of resistance.